Arqueólogos que excavaban en el foro romano se encontraron este lunes 29 de mayo con una tumba que contiene los restos de una mujer de unos 30 años que se calcula vivió en el siglo décimo antes de Cristo. El enterramiento contenía varios objetos de valor -como un collar de ámbar, una fíbula y un anillo-, lo que indica que la dama en cuestión pertenecía a una familia de alto rango. El superintendente de asuntos culturales de la capital italiana, Eugenio La Rocca, dijo que la tumba se encontró al lado de otra aún más antigua que fue descubierta el año pasado. 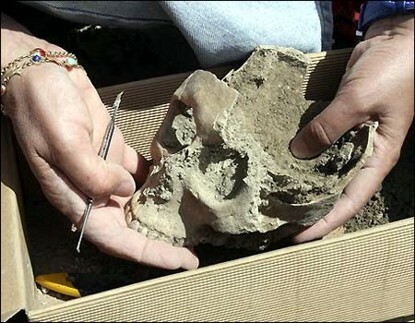 "Las últimas excavaciones nos hacen creer que esta zona era de hecho el cementerio de los Latinos, quienes vivieron al lado del borde con Arce, en el área de las colinas que formaron el Capitolio", añadió La Rocca. (ANSA) - ROMA, 29 MAG - Una tomba del X secolo a.C. é stata scoperta questo pomeriggio durante scavi archeologici nell'area del Foro di Cesare, ai Fori Imperiali. Nella tomba sono custoditi i resti di una donna dell'apparente eta' di 30 anni. 'Il ritrovamento e' la conferma - ha commentato Gianni Borgna- che questa zona era abitata prima della nascita di Roma. Ora proseguiremo il lavoro di documentazione'. Gli scavi sono condotti dalla sovrintendenza comunale e dalla soprintendenza archeologica di Roma. 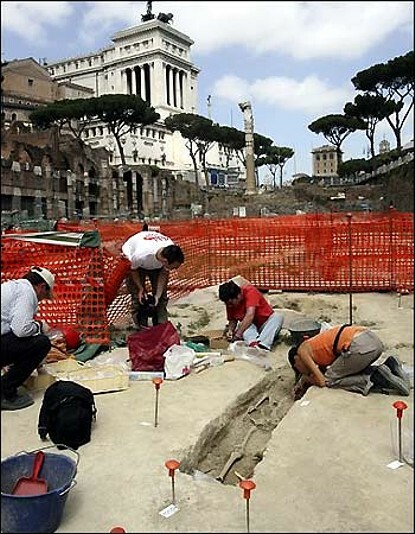 ROME  Archaeologists said Tuesday they have dug up a woman skeleton dating to the 10th century B.C. in an ancient necropolis in the heart of Rome. The well-preserved skeleton appears to be that of a woman aged about 30, said Anna De Santis, one of the archaeologists who took part in the excavations under the Caesar's Forum, part of the sprawling complex of the Imperial Forums in central Rome. An amber necklace and four pins were also found near the about 5.25 feet-long skeleton, she said. The bones, dug up Monday, would likely be put on display in a museum after being examined further, De Santis said. It was the first skeleton to be found in the 3,000-year-old necropolis, she said. Early this year, a funerary urn that contained human ashes, as well as bone fragments that appeared to be from a sheep, were found in one of the necropolis' tombs. Alessandro Delfino, another archaeologist who took part in the excavations, said Monday's discovery highlighted a "social change" in the funerary habits of the people who dwelled in the area, from incinerating to burying the dead. Experts have said the necropolis was destined for high-ranking personalities  such as warriors and ancient priests  heading the tribes and clans that lived in small villages scattered on hills near the area that later spawned one of the world's greatest civilizations. Excavations & Discoveries of the Bronze Age Tombs (1999-2006). [correct captions and dates will be added shortly].